This creature resembles that of an alien spider mutant. However, I can assure you this insect is terrestrial in its origins. Although “Centi-” means 100, centipedes in Minnesota typically only have fifteen sets of legs. These sets of legs are very beneficial for centipedes as it makes them rather quick when escaping from a predator or attempting to capture a meal. Centipedes have been found to travel about 1.3 feet every second, which means they can quickly escape to the shelter they prefer which is typically underneath something as centipedes prefer overhead shelter. Much like spiders, this small creature has a diet of other insects. 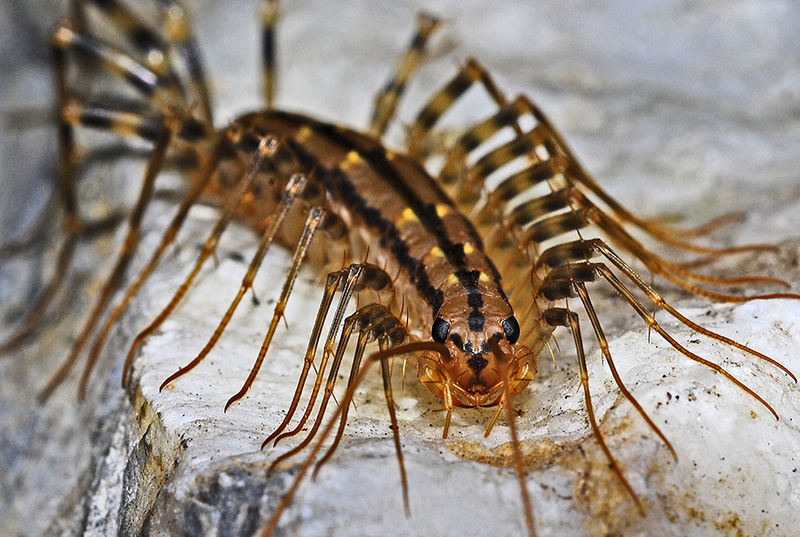 Sightings of centipedes in your home typically indicate that there is an ongoing insect population. Centipedes enjoy feeding on ants, silverfish, spiders, beetles, moths, fleas, and any other small insect that may be in your home. Centipedes are equipped for nighttime hunting. They have large eyes and antennae that are sensitive enough to pick up both sound and smell; for this reason, they seek out areas that may be dark all day so as they can hunt longer. These traits make the centipede the perfect nighttime insect assassin. Unlike their cousin the spider, centipedes are active hunters. They are pursuing prey rather than using webs or traps to capture their prey. House centipedes prefer areas of higher moisture. Therefore, they are very common in basements of homes and bathrooms. Centipedes are believed to have started in the Mediterranean. They prefer warm, humid climates. However, they are incredibly adaptable to their climate and can live in almost any environment. If house centipedes can avoid predators and efficiently hunt, they have been found to live for more than a year which is long for an arthropod. These insect assassins with 30 legs typically enter through the home underneath doors, through cracks, or really any opening into your home. Door sweeps should be installed, and caulking should use to seal up any cracks or holes. If you see these dart across your floor, wall, or ceiling, the good thing to know is that that is about the most harm they will cause you. If you were to be bitten, a centipede bite resembles a spider bite, and the reaction typically produces a small reddish bump. To learn more about how Abra Kadabra can help you control a centipede issue, contact the pest experts here or call (763) 537-0330. Our licensed insurance experts will be happy to answer any questions you have.